Live to Vue Cinema, Halifax from Cardiff Principality Stadium on Saturday, June 8. 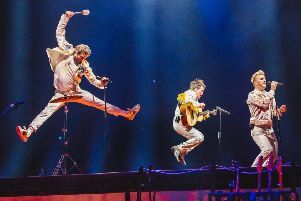 Supergroup Take That is celebrating its 30th anniversary in style with a massive stadium tour. And for one night only, the Greatest Hits tour will be coming live to Vue Cinema Halifax. Visitors to Vue will be able to see the show – filled with fan favourites spanning three decades – as it happens live from Cardiff’s Principality Stadium. With previous tours featuring giant walls of water, holograms, and a carousel of dancers and band members suspended in the air, the group will be going bigger and better for what is set to be one of the musical big screen events of the year. Johnny Carr, Event Cinema Manager at Vue UK and Ireland said: “Take That are renowned for bringing a spectacular, cinematic quality to their live concerts, so it is a natural fit for audiences across the country to be able to witness them in all their glory on the big screen.